November announcements are coming this Thursday. Angelman and Steel76 like this. The November announcements arrived a day early. This November, INDICATOR combines fantasy and fright to deliver another exciting month of unmissable releases. First, we return to the wonderful worlds of Ray Harryhausen to bring together three more of his much-loved films into another collectable box set. Then, we unleash a duo of dark and disturbing chillers onto Blu-ray for the very first time. On 13 November, INDICATOR presents THE WONDERFUL WORLDS OF RAY HARRYHAUSEN, VOLUME 2: 1961-1964. This third and final Limited Edition box set of the pioneering visual effects giant’s celebrated work contains three more of the great Ray Harryhausen’s most beloved films: MYSTERIOUS ISLAND (Cy Endfield, 1961), JASON AND THE ARGONAUTS (Don Chaffey, 1963) and FIRST MEN IN THE MOON (Nathan Juran, 1964). The first and last of these classic adventures are presented for the first time on Blu-ray in the UK, and this numbered limited edition collection contains a wealth of essential extra features and comes packaged with an exclusive 80-page book. These all-time classic adventures, each featuring pioneering special effects by filmmaking legend Ray Harryhausen, are presented here in stunning 4K restorations. Containing a wealth of new and archival extras – including audio commentaries with the great Ray Harryhausen himself, a Jason and the Argonauts commentary with Lord of the Rings director Peter Jackson, new interviews with SFX maestro Hal Hickel and genre-film expert Kim Newman – this ravishing Limited Dual Format Edition Box Set from Indicator is strictly limited to 6,000 units. baggio, zbinks, Steel76 and 1 other person like this. Then, on 20 November, INDICATOR unleashes two Blu-ray premieres: Irvin Kershner’s stylish mystery EYES OF LAURA MARS (1978), written by the legendary John Carpenter, and starring Faye Dunaway and Tommy Lee Jones in an early lead role; and Mike Nichol’s genre-bending WOLF (1994), with its all-star cast featuring Jack Nicholson, Michelle Pfeiffer, Christopher Plummer and James Spader. baggio, zbinks, dave13 and 2 others like this. Wolf was a pleasant surprise when I finally got around to watching it. Might just have to pick that one up! That new Harryhausen box set includes some of his best movies. I can't count how many times I watched Jason and the Argonauts, when I got it on VHS back in the 80:s.
The battle against the skeletons, are still impressive. It must have been hell to animate. First Men in the Moon, has some really impressive matte-paintings and sets. It's also one of the better ones, when it comes to the characters and the script. Watch this space for something a bit special very soon Garry, you will not be disappointed. Great movie! Glad this is coming from Indicator since I never bought this on Blu-ray. Should be an awesome release in their hands. Katatonia, baggio and zbinks like this. Couldn't be easier. Not like that last replacement program from Vestron. All I did was give them a proof of purchase(took a picture) and back of Blu-ray set(took a picture), boom done. About the limited VS regular releases. The unlimited release of Christine, has a standard clear Blu-Ray case, compared to the Criterion style they used on the limited. So it's not only the lack of booklet that sets them apart. 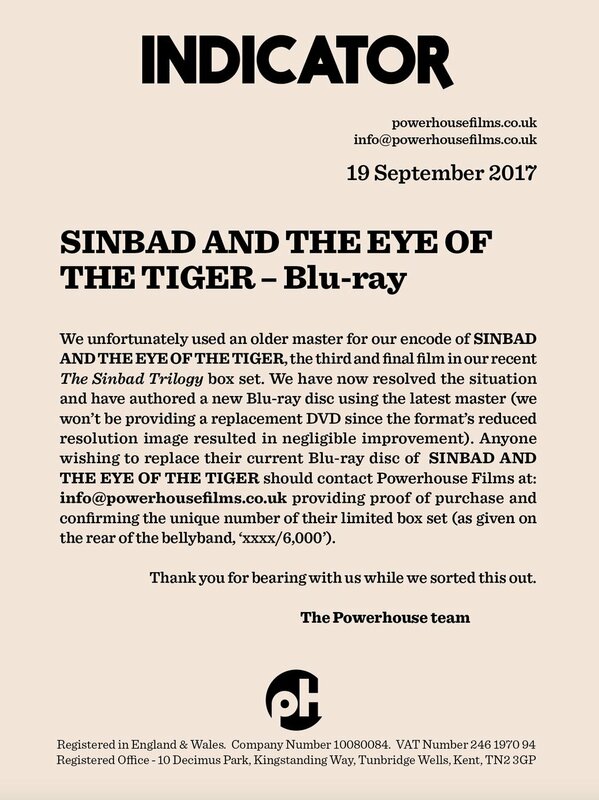 Curious, if anyone that participated in the Sinbad replacement program get their replacement Blu yet? Personally I did not receive anything yet. I know they said 10 - 15 working days to ship to US. It's about 21 days(working), 29 total now. Sure it should be here soon. Same here, Baggio. I contacted them to check status. They had confirmation it shipped from the UK on 9/29, but nothing after that. I thought mine just got lost, but obviously not since we're all in the same boat. It sounds like they shipped them by the Pony Express.